CatacombGL is a Windows source port of the Catacomb Abyss and Catacomb Armageddon. The main goal of this source port is to improve the visual presentation of the games. It features hardware accelerated 3D rendering via OpenGL, supporting widescreen resolutions, a customizable field of view and an uncapped frame rate. 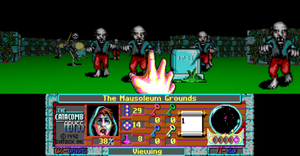 The first version of CatacombGL was released on September 10, 2018. Version 0.1.0 only supported the Catacomb Abyss. Support for Catacomb Armageddon was added with version 0.2.0, released on March 31, 2019. The source code is licensed under GPL3.